Keep your cords and accessories under control with this zippered storage case. Neoprene on one side with the Camaro signature and rally stripes logo in silver. See-thru mesh on the other for a quick visual of what's inside. Zippered gusset expands for additional room. 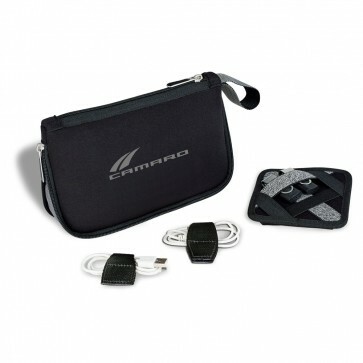 Includes elastic organizer that securely holds small electronic cords and adapters. The organizer also has a Velcro® pouch on one side for additional storage. Two magnetic cord wrap organizers also included. 9.5"L x 6"H x 2.5"W .
Camaro Glass Tumbler Set | 13.5 oz.